On February 5, 17 years ago, the 24 Hours of Daytona would mark the start of the 1995 IMSA GTS-2 season. More importantly, it would mark the start of BMW's all-new GTS-2 M3 program. Organized in just 60 short days, a pair of E36 M3s that mirrored their showroom counterparts took to the infamous Florida track, to which they qualified pole and third on their first-ever outing. It came as little surprise to BMW and the Prototype Technology Group (PTG) team that the GTS-2 M3s would go on to solidify the second-generation M3's position in racing history. The 1995 Sports Car season proved to have its challenges for the new PTG M3s. The pair of E36s were the only unibody cars in the series, taking on lighter tube-chassis cars such as the Porsche 911 and the Mazda RX-7. After just 3 races into the Exxon-sponsored series, BMW realized that in order to remain competitive, the cars would need further development and modifications. Opting out of the 4th race to work on the cars, they were pushed to the GTS-2 limits, including a drop in overall weight. The result? The very car before us. On May 29, 1995, David Donohue scored the team's first podium finish in the newly revised #6 M3. 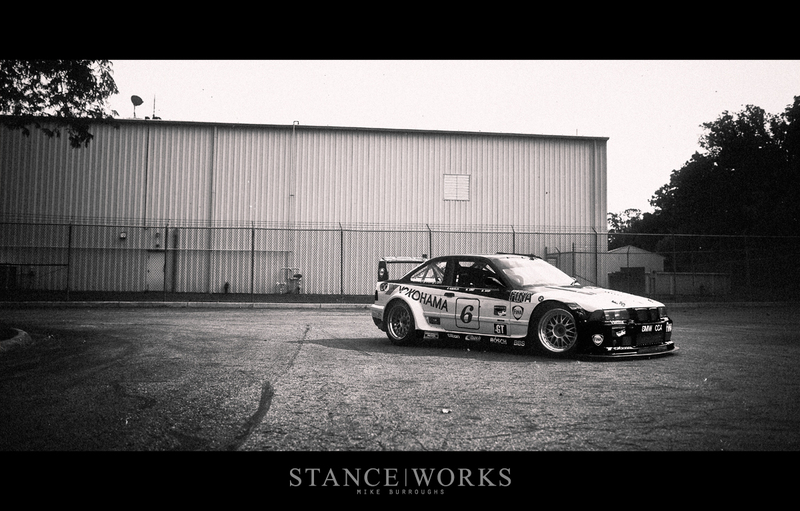 Never dropping below 4th place during the duration of the race, Donohue and the PTG team were finally able to show the world what the successor to the E30 M3 was capable of. However, luck wouldn't be on their side at the following race. Difficulties still plagued the team and cars- the inaugural season for the PTG team proved to be more of a learning experience than anything else. The cars suffered from engine issues, as well as several other technical difficulties throughout the rest of the season. Despite the hardships, the team claimed 4 "top 5" finishes and 7 "top 10" finishes for the 7 races of the season. Not to be shied by the trials and errors of their first trip around the block, Erik Wensberg, M Brand Manager for BMW NA, put it simply: "Our goal for 1996 is to win the IMSA GTS‑2 manufacturer's and driver's championships, and we will arrive in Daytona in February fully prepared to pursue these titles." The 1996 season began, as always, with the 24 Hours of Daytona. The #6 M3 would start the season off with a serious bang: A new qualifying record meant pole position for the first race of the series once again, and a podium finish meant that BMW and the PTG team were back with a vengeance. The pair of M3s, #6 and #7, qualified for the top two positions of the second race, leading for eleven of the twelve hours and landing them a second 3rd place finish. With a 2nd place finish under the PTG team's belt after the following race, Bill Auberlen was welcomed to the PTG team, piloting the #77 car which lead for 135 consecutive laps of its first race. The team would continue to press forward in full force, making their presence not only known, but threatening to every other car on the tarmac. The #6 car would continue to land podium finishes for the rest of the season, except for a single 4th place finish at the Dallas Street Circuit. At the Sears Point Raceway, the M3s would take home a First, Second, and Third place finish, claiming the podium as their own. After a first place finish (the fourth in a row for the team) at the Daytona final in the hands of Javier Quiros, the #6 M3, and the rest of the team, could call the season a resounding success. The standings landed BMW their first IMSA GT Manufacturers Title since 1981,which was only the tip of the iceberg for the 1996 season. Achievements such as four fastest lap records, seven pole-position records, and 14 top-3 finishes all stand as proof that Erik Wensberg's claims the previous year were anything but empty threats. Yet, somehow, BMW and PTG would outdo themselves yet again in the 1997 series. With one Manufacturers Title under their belt, BMW was rather keen on a second. 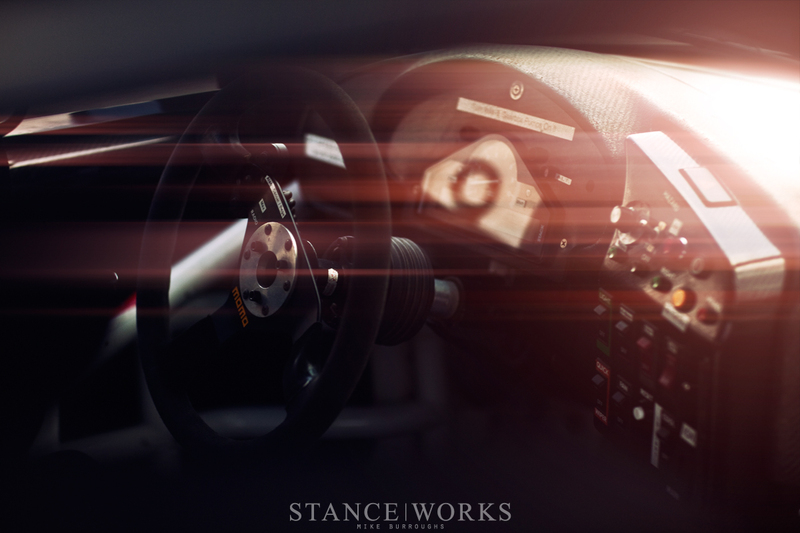 However, the term "Ultimate Driving Machine" didn't merely represent the idea of "we win races." It was much more akin to "we destroy our competition and claim the fruits of victory for none but ourselves." The 24 Hours of Daytona was won by the #10 PTG M3 with Bill Auberlen at the helm. The GTS-2 series had been re-designated to GTS-3, and as such, was BMWs first GTS-3 victory in the 35-year history of the race. Furthermore, it was BMW's third Daytona 24 victory n history, following an overall and GTS‑1 class victory in 1976 by the E9 CSL and in GTS‑1 class victory again in 1981 by the M1. The PTG M3s continued crushing the competition, taking a 1st, 2nd, and 3rd place triple-finish at the fourth race of the season. And then again at the 9th race. And 10th. And 11th. The M3s won all but two of the races for the season, securing their second consecutive Manufacturers Title by a staggering 86 points over Porsche. In fact, between BMW, the PTG team, and driver Bill Auberlen, the M3s captured every championship available in the GTS-3 class. Auberlen took home the Driver's Championship Crown and PTG secured the inaugural Team Championship. The 1997 season proved to be an absolute blowout, with the team recording 22 podium finishes, four qualifying records, five fastest laps, and seven of the top ten drivers piloted the M3s. But on an all-time high, could the group maintain momentum for the 1998 season? Returning to the Daytona 24 once again, and this time classed as GT3, the #6 and #10 cars took home a one-two finish. If the previous seasons weren't going to foreshadow the 1998 series, the first race certainly would. From then on, the #6 car would bounce between GT2 and GT3 classes while #10 and #1 teammate cars would hold down the GT3 class for the season. The #6 car went on to win every GT2 race it was entered in, and along with the other two cars, the M3s would win 9 of 13 of 1998's GT3 class races. The BMW team proved to be an untouchable powerhouse. BMW took home their third consecutive GT3 Manufacturer Title, PTG took home their second consecutive Team Title, and of course, the drivers took home the Drivers Title along with the next top 3 positions. Yet that only tells the half of '98s story. The '98 season proved to be doubly victorious, with BMW taking home another GT3 Manufacturers Title in the USRRC (United States Road Racing Championship), their first-ever for the series. But if two Manufacturers Titles in a single season weren't enough, PTG took home the USRRC Team Title as well. The drivers yet again walked away victorious with the Driver Title in hand. The accolades acquired by the team seemed to be endless between the number of wins, the track and qualifying records, and the back-to-back wins at the endurance races. These magnificent cars were truly unstoppable. With the new E46 chassis already a year into production by 1999, the sport-dominating PTG E36s were scheduled to be phased out, and by 2000, replaced with the all-new E46 M3 counterpart. 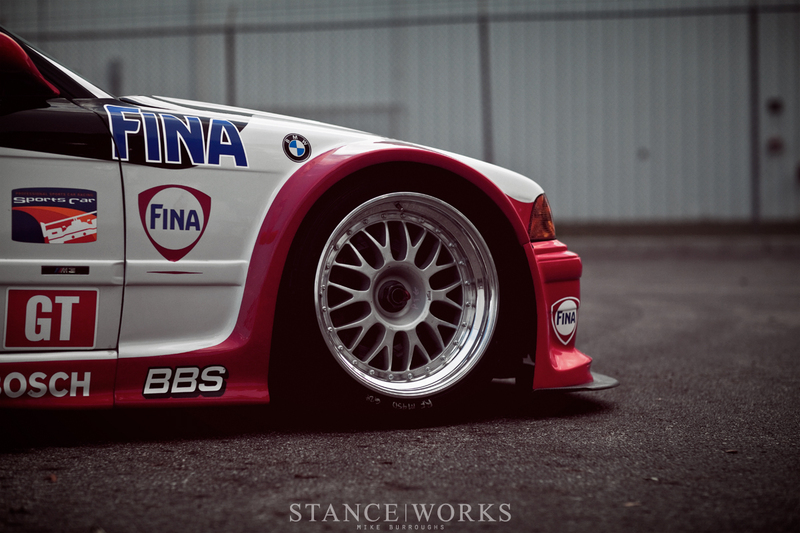 For their final year of competition, the PTG E36s were unleashed on the American Le Mans Series. The cars themselves were now five years old, and the competition proved to be newer, faster, and stronger. However, PTG's last fight wouldn't be a futile one: one final Title, this time for taking out the entire field of GT competition, sealed the fate of the PTG E36 as one of the most successful chapters in BMW's motorsport history. PTG would continue to dominate the sport with the new E46 M3; however, the E36s, driven hard and put up wet, were left to the history books. Thanks to fellow enthusiasts at BMW of North America who recognized the car's importance, this particular M3 was re-claimed by BMW and now resides in Ohio amongst some of the greatest cars of BMW NA's racing history. My chance to spend one-on-one time with this car proved to be not only educating, but enthralling and entrancing. 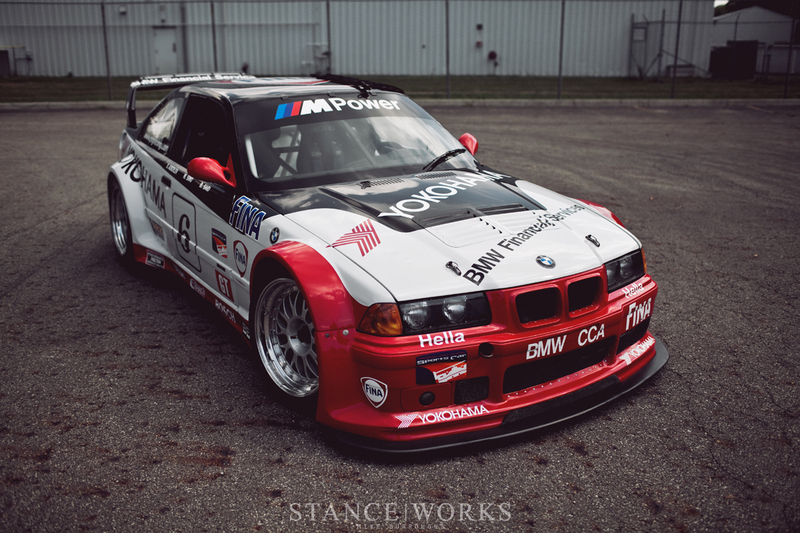 A childhood hero, the E36 of E36s, this car was nothing less than a gladiator to me. It left no room for opposition, slaughtering everything in its path; it carried success on its back without err, touting its success in racing for the rest of motorsport history. The wide arches, tall spoiler, agressive splitter, and the now-iconic black and red livery make this car stand out to any automotive fanatic, and now you know why. 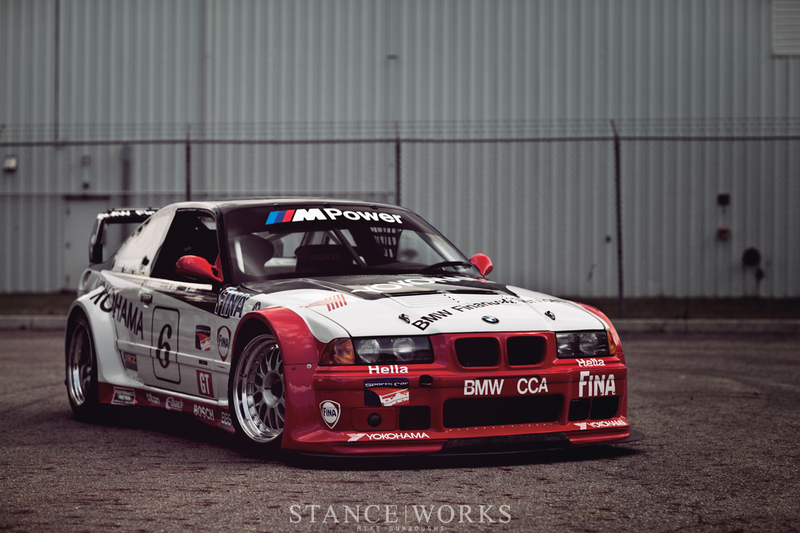 The PTG E36 is the ultimate counterpart to the street M3, showing that BMW, PTG, and the astounding list of world class drivers enlisted to race these machines, formed one of the greatest teams in motorsports. I can't say I blame them for saying the BMW M3 truly is the ultimate driving machine. Can anyone upload this photo on a better resolution? I really want to put it on my desktop wallpaper, my resolution is 2560×1440, any resolution close will be perfect! I am currently awaiting a engine from Metric Mechanic out of Missouri. It will generate “I am told” 330hp. With it having a supercharger and after cooler, I am hoping to generate 700 hp. My only concern is will the drive train respond positively to all the power it will be receiving. All of this to be installed in an E36 that i have owned since 1998. Wish me luck at the track when I get it there.